…to Haus Seeschwalbe! Whether you like to relax, explore, enjoy the fresh air and nature or take advantage of the many exciting leisure activities – the three star superior hotel Haus Seeschwalbe in Cuxhaven-Duhnen is the perfect hub for your North Sea vacation. We Keep It Traditional – Quality You Can Feel. Over generations, Haus Seeschwalbe was shaped by many contributors and companions. The personal commitment of the old-established hotelier family Braband is ever-present, just like the fresh sea breeze. Service is the priority for the current owners Stefan and Angelika Braband and their team. It comes as no surprise that Haus Seeschwalbe carries the certificate for service quality in Lower Saxony (ServiceQualität Niedersachsen). Are you looking for a view of the North Sea, a south-facing balcony, a small apartment or space for the whole family? Our 50 rooms and four apartments are available in different sizes and with different features, so every guest can choose what makes them feel most comfortable. The North Sea is Our Front Yard. The sea is just a two-minute walk away. Feel the sand under your feet. Breathe in deeply and enjoy our wonderful beach. Here in Duhnen, the gorgeous landscape is covered with heaths, forests and moors. Sun worshippers, hikers, cyclists and nature enthusiasts alike get their money’s worth. Go for “a hike on the bottom of the sea” in the national park Wadden Sea, Germany’s most significant natural habitat and UNESCO world heritage site. And what about a unique carriage ride? Journey straight across the tideland with a Wadden wagon from Duhnen to the island of Neuwerk. You Vacation. We Do The Rest! This is our motto and naturally, it applies to all aspects of your stay with us, first and foremost your accommodation. Our variety of rooms has something in store for every taste. Especially, room to relax! 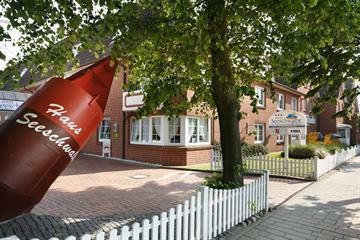 Choose from 37 double rooms and 12 single rooms, four apartments and our Seeschwalbe Dream Studio. Our rooms are as unique as you. They vary in size, design and features, meeting the most diverse demands. Which fits you the best? Your Home at the North Sea! Are you ready to relax in the comfort of your own Seeschwalbe apartment, with all the amenities of a fully equipped kitchen and your personal place in the sun? Our four lovingly furnished apartments are waiting for you. Come on in, make yourself at home! Breakfast, coffee, drinks: Pure enjoyment! Whether you are planning a trip to the beach, a hike or a bike tour, with our plentiful breakfast buffet, you can enjoy a fresh and healthy start to the day. In the evening, you can swing by our bar “Alexander von Humboldt“. Enjoy the rustic, maritime atmosphere with long drinks, beers on tap and good wine. There is no better way to let a day by the sea wind down. Can’t Get Enough of the Sea? At our rustic hotel bar “Alexander von Humboldt“, there is no such thing as too maritime. It is filled with a variety of real treasures of the sea and even more nostalgic stories. Your host, hotelier Stefan Braband, has personally collected gorgeous rarities – from the unique ship in a bottle to the precious figurehead. And so it happens that along with a good drink, you might be handed an exciting anecdote or two across the bar. We enjoy relieving our guests of a few everyday troubles – these have no place in your holiday. Parking? The hotel offers free parking spots on the property. Having trouble walking? Use our elevator. Your family is out for fun, you simply want to relax? Enjoy special conditions at the nearby water park “ahoi!“, complete with sauna facilities. Restless kids? A playground is waiting for them in our garden. We are sorry, but pets are not permitted. Learn everything about our current offers.